My thanks go to E. J. Campfield who generously shared the text included below. 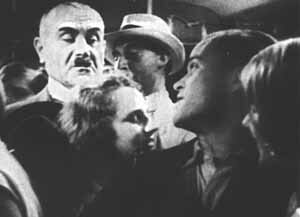 It is his translation of a key scene from the German film Kuhle Wampe (1932), English title: To Whom Does the World Belong? cowritten by Bertolt Brecht, Slatan Dudow and Ernst Ottwald. Please note: This translation is under copyright, so if you do wish to reference it elsewhere, please do so with proper credit / permissions. You see, we don't need all that coffee. We Germans are a frugal people. The point is, we have to make ourselves independent of foreign countries. We need to grow our own coffee here in Germany, you see. Instead of producing so much wine in the Rhineland, we should be growing coffee! You see? We could buy the wine from France. And then there'd be peace in Europe, you see!? The Fat Bald Man misses the unintentional humor in this. Yeah, but the two of us, we're never going to change the world. That's right... You two won't change the world. A close angle on Kurt. A close angle on the Woman with Coral Necklace. Close angle on Old Man with Glasses, sleeping. 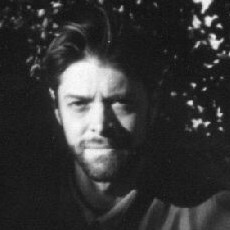 Close angle on Man with White Hat. ...a politically apathetic guy like you -- not ever. Close angle on obviously Well-To-Do Man. ...he won't be changing the world either. You all like it too much the way it is. (each word boldly, antagonizing) And just who is going to change it? A very close angle on Alice. (boldly, separating each word) Those who don't like it the way it is! That's a great scene. The last line and the lady are smart. Doug: I saw that movie at least ten years ago, and that scene is the one that stuck. While searching for it, I saw that that is also the universal opinion. Incidentally, I only doctored the name. I didn't change anything on the translation. Evil Minx: The scene, as it was filmed, was certainly intense, intense enough to recall it more than ten years later. And Campfiled's translation captures the mood just as I remember it. I don't want to catch anybody drawing Chaplin mustaches on Alice's picture! Y'hear? The film came out in 1932, before Hitler siezed power (Jan 1933) and was almost immediately banned. According to the German Wikipedia (the English one is somewhat inaccurate): The President, Justice Department and Religion considered themselves to have been insulted by the film, although neither is mentioned. The entire film carried a marxistic message, which was the real reason for the ban. Ironically it was banned in the Soviet Union too because the portrayal of the German workers showed them living better than the Soviet/Russion workers. In Germany the ban was partially lifted following demonstrations against the ban, but it's safe to assume that it was banned again when Hitler took over. Brecht fled Germany late February, a day after the Reichstag was set on fire. she will change the world-what a touching tribute! I'm sure Alice is really pleased with your birthday greetings. Thanks for giving us the link to her blog. And ofcourse, the scene is really, really funny, even though you took your poetic licence with it. As for the camera attendants, and being flogged to death, the kind of labour laws we have in India, people in all industries are over-worked, exploited and under-paid. There have been documentaries made on extras, on stunt artistes, a friend of mine also made a docu called "Safety Takes" about the complete lack of safety regulations in the industry. Well! Batul: That post of yours really shocked me. I'm starting to understand also why so many US companies are opening up and hiring in India - cheap labor, and no protections. It seems like all the people I'm corresponding with in India are doing a horrendous amount of overtime. Ha, ha ,haaa! What a great lead-in and I so didn't see that coming! A grea intro to your site for me since I love me the Coop! She is definitely one to read and just adore! Great post! That song by Michael Jackson came to my mind as I was reading this: Heal the World! Miz_Bohemia: I owe this post to Bertolt Brecht and E.J. Campfield's excellent translation of same, and of course Alice, who was kind enough to have a birthday for us, and post her photo at her blog. Usually I have to do everything myself! Jamie: We started last week with spring cleaning. It's not much, but at least it's something. Hey I like the King of Pop! He was a very good performer. I really really like your blog. A lot. A lot a lot. I love the concept. I was wondering if you'd write a story about one of my photos? You can use any photo here www.pirate-soul.deviantart.com or here www.pyrate-stock.deviantart.com there are some interesting photos somewhere, you just gotta look a bit. Anyhoo. Let me know if you do. I'd be honoured. I was also wondering if you'd be terribly put out if I... copied, I guess... your idea? I mean, write stories from photos. Can you believe I just read the actual description of your blog? For shame BoheMia! Beautiful concept and beautifully woven words to describe said concept I must say... much magic attached to it. I read it before taking an improvised nap and it was the best way to drift off into slip, with the magic behind this here synchronicity of indeterminacy playing in my mind... hope you are having a good weekend! Viruswitch: Sorry I didn't answer your comment right away. I did like his music up into the early 80's but I dont really know what he's up to now. Pizazz: Thank you for the warm compliments. I'd love to write something to one of your photos - just now I had a quick look and I do think they're really good. This idea of writing stories to photos isn't entirely new - but if you saw something here to inspire you, that is even a higher compliment. Let me know if you start something and I will add a link to it. Miz B: Shame on you for reading my blog description! It was supposed to be secret. You won't tell anyone what I wrote, will you? I'm running out of ways to say thank you for nice compliments. What do I do now? Everyone: I intended to post this weekend, but I had some other writing tasks to take care of. One will be a guest blog post somewhere else later this week. I'll post a link as soon as it's online. Thanks, everyone, for being so patient.